Celebrating Art through the Ages! Artopia offers 3 hours of interactive, authentic arts programming for families at no cost. Drawing in more than 300 families each year, Artopia celebrates arts-learning and arts-making through a diverse program of engaging, multi-disciplinary workshops. 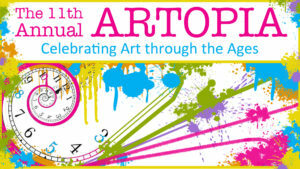 Every Artopia boasts an arts-infused theme, with this year’s theme being Art through the Ages. Professional artists will take you back in time through a series of historical arts workshops. Children will use their imaginations and curiosity to build their take-home artworks, and also get on stage. Past projects include leaf stamping, spoon maracas, homemade board games, and painting name-based hieroglyphics. Teaching Artists will also facilitate interactive performance workshops in Hip Hop, Ballet, and Improv, followed by performances from Wingspan Arts’ Cabaret Troupe and select Afterschool music and dance classes. Price: FREE! Suggested donations will benefit Wingspan Arts’ educational programs. Activities are for all ages, but geared towards children 4 – 10 years old. *A detailed schedule of events is listed below. Questions can be directed to Meghan@wingspanarts.org. Thank you to our sponsors, GUS Soda and Insomnia Cookies! The cafeteria will feature various workshops with the theme of ART THROUGH THE AGES. There will be an Ongoing Activity in each area, which do not require a sign-up. Students can drop in on those throughout the day whenever they want! Most areas will also feature a Scheduled Workshop, which require a sign-up. Only 10-12 children can sign up per 20-minute session. Those sessions will be: 11:10-11:30, 11:40-12:00, 12:10-12:30, 12:40-1:00, 1:10-1:30, and 1:40-2:00. Children can sign up for Scheduled Workshops when they arrive at Artopia. There are no advanced reservations. The Auditorium will feature performances and workshops in the Performing Arts. Students from various Wingspan Arts programs will perform in addition to performing arts workshops for anyone to join!